2018 Chevrolet Cruze Diesel Hatch. Words by Andy Lilienthal. Photos by Mercedes Lilienthal. Let's just get all this out on the table. Volkswagen was the king of diesel cars in the U.S. until this whole dieselgate thing happened. As you're likely well aware, VW was caught cheating on emissions testing in late 2015 and the whole thing resulted in a global scandal. At this moment, VW no longer offers its formerly popular TDI-powered cars in North America. 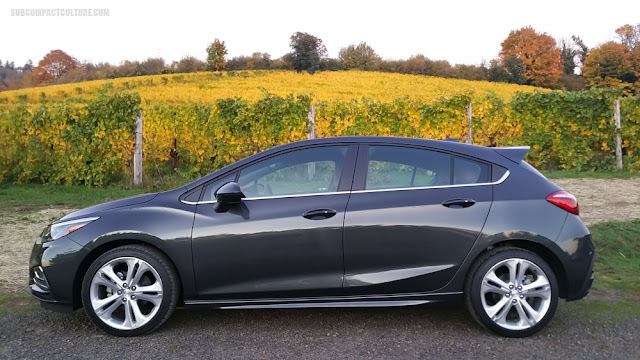 As this whole debacle was going down, Chevrolet was preparing to offer its compact Cruze Sedan for sale in North America with a 1.6-liter turbodiesel engine. Chevy was essentially watching its future competition unravel before its very eyes just as it was about to bring its own diesel offering to market. I bet that was an interesting time in the GM offices. They must've known this whole VW scandal could leave a smoky, sooty taste in the mouths of potential buyers of diesel-powered vehicles, no matter what the brand. 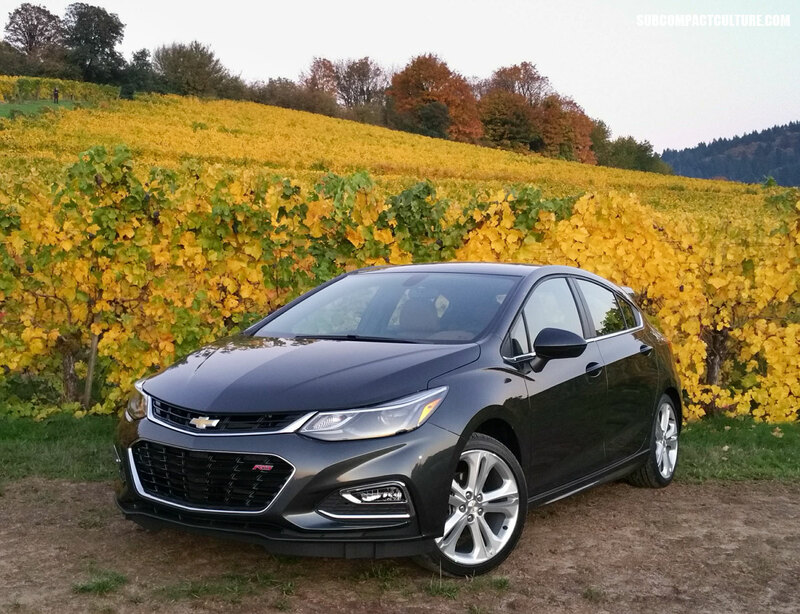 Chevy proceeded to sell its 2017 diesel-powered Cruze Sedan, and for 2018, without a single new VW TDI in sight, has brought its Cruze Hatch to market with the diesel powerplant. Note to reader: It's 2017. Diesel engines have come a long way since the 1980s, so get that idea of a loud, smoky, rough engine out of your mind. Plus, they start easily in all sorts of weather. With the Cruze Diesel, press the start/stop button, wait a couple seconds, and the engine comes to life. The engine is smooth, quiet, and smoke-free. In fact, you'd probably never know it was a diesel unless someone told you. The 2018 Cruze Hatch Diesel is powered by the same engine in the sedan: a 1.6-liter turbodiesel Ecotech mill producing 137 hp and 240 ft/lbs of torque at just 2,000 RPM. As you'd expect, there's ample low- and mid-level power from the engine. While it's probably not going to win most street races (unless you're racing most of the cars we own), it's not a dog. Again, low- and mid-range torque is the story with acceleration. Our model was mated to the nine-speed automatic transmission, which provided easy, smooth shifts without hesitation. And before you ask, yes, the Cruze Hatch is available with a six-speed manual transmission—something I'd love to experience. My only criticism with the trans is minor one, and not really part of its mechanics: The shifter doesn't line up with the park, neutral, reverse, drive icons on the console, and I was forever looking at where I was. OK, one other minor thing: You do have the ability to switch the gears yourself, but instead of moving the shifter up and down (like a tiptronic manual), it's simply a small rocker switch atop the gear selector with a + and a -, which isn't very engaging. But alas, if you really want to shift a Cruze Diesel yourself, you'll get the manual. I digress. Another thing this car's engine offers is automatic start/stop. You come to a complete stop at a traffic signal or stop sign (or even in traffic), and the engine shuts off to save fuel. It's a simple, effective technology. I'd estimate that it would enter into start/stop mode about 80% of the time I'd come to a complete halt. It works well and you get used to the thing turning on and off all the time. A co-worker did ask if it could be disabled. He was concerned about having to replace a starter prematurely. Chevrolet says the starter has been extensively tested with the start/stop technology and there isn't anything to be concerned about. Of course, the other question people want to know about the diesel-powered Cruze Hatch is fuel economy. 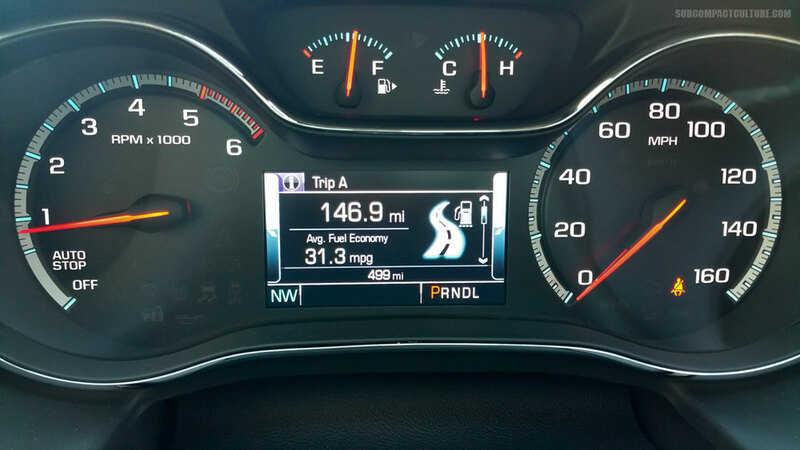 The car is rated at 30 city, 35 combined, and 45 highway MPG. The car has a maximum range of 607 miles, too. During our test week, we had the car in mostly urban environments with a couple of highway blasts. 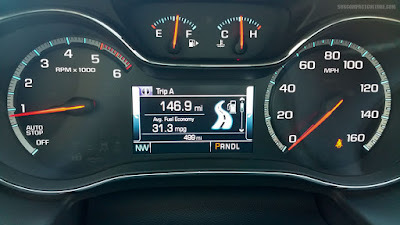 We achieved 33.5 MPG over about 200 miles. 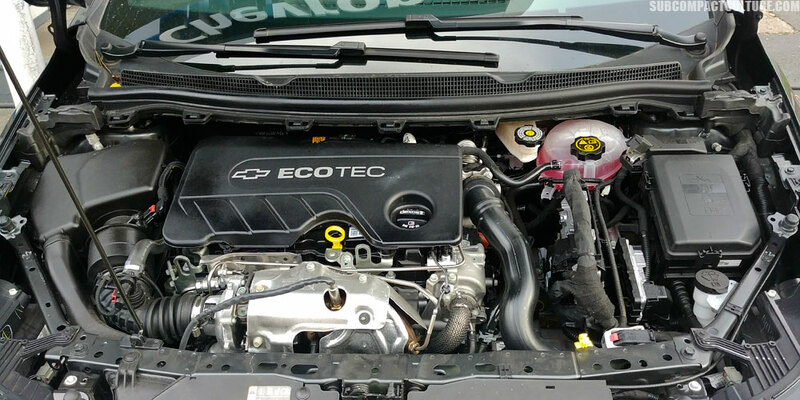 For comparison's sake, the 2018 Cruze Hatch with the turbocharged 1.4-liter gasoline engine is rated at 29 city, 32 combined, and 38 highway MPG. Welcome to the paragraph with the cliche subhead! But it's true, the Cruze Diesel is a smooth operator. Where this became most evident is when I took the car onto the Interstate and cruised at 70 to 75 MPH. I was shocked to hear how quiet this car is at speed—diesel or not. In fact, I'm told the car is at the top of its class in NVH (Noise Vibration Harshness) levels. I believe it. Oregon has lots of old coarse aggregate roads, so I don't care what you're driving, if the tires are touching the pavement, you'll hear road noise. But when I got the Cruze Diesel onto some newly paved stretches of I-205, I was very impressed by the lack of noise. It was almost like being in an EV. No lie. If I had to choose a compact car to drive across the country, this would be it. Our review car had the sporty RS trim package and includes rear spoiler, front fog lamps, sport body kit, RS ornamentation, and 18-inch machined-face wheels wrapped in 225/40/18 tires. Handling felt taught but not too firm. The steering was quicker than I expected and the car was quite fun to throw into corners. 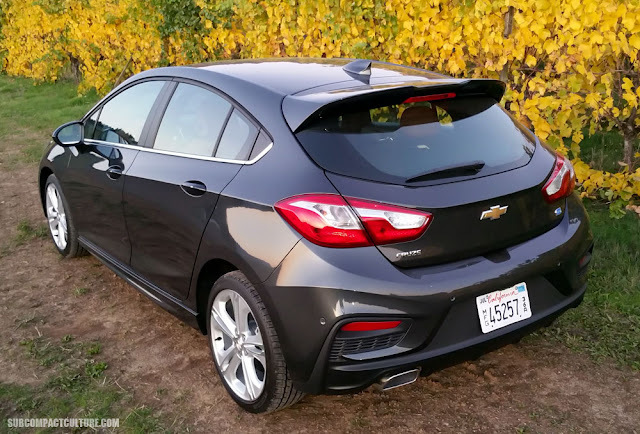 Chevy seemed to hit that sweet spot of sporty comfort with the Cruze Hatch, especially with the larger 18-inch wheels/tires found on the RS package. We're unabashed hatchback fans. Not only do we like the looks, but we prefer interior hatch's functionality over a sedan's trunk. 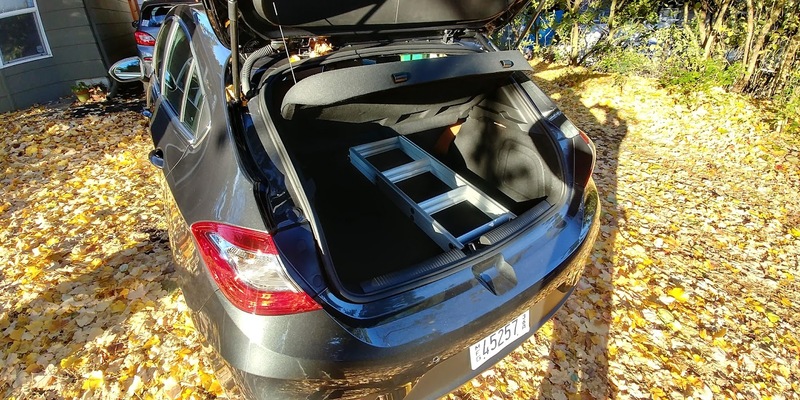 We put our Cruze Hatch through its paces during our test week, carrying everything from a ladder, to 120 lbs. of cat litter; cases of wine, to luggage for a trip to the airport. The Cruze never flinched. There's abundant cargo space and the rear seats fold down for even more. If your only cargo is going to be the human variety, the Cruze Hatch is surprisingly roomy and comfortable. 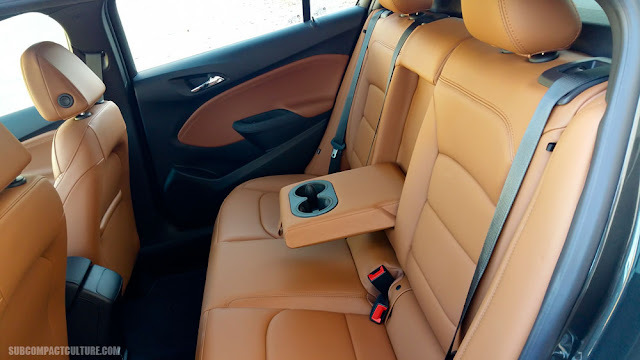 We did find the front heated seats a bit flat, but the rear seat was spacious. One 6'-2" friend did say he wished there was headroom in the back seat. My 5'-7" frame had no issues. In terms of style, I really liked our tester's two-tone black-and-tan looks and modern shape. However, the two-tone look was also described as too "butterscotch" or just not appealing by some of my passengers. Plus, Mercedes (my wife, not the car company) thought the rear visibility could be a bit better. She also found the butterscotch accents on the dash too reflective and a bit distracting when driving. 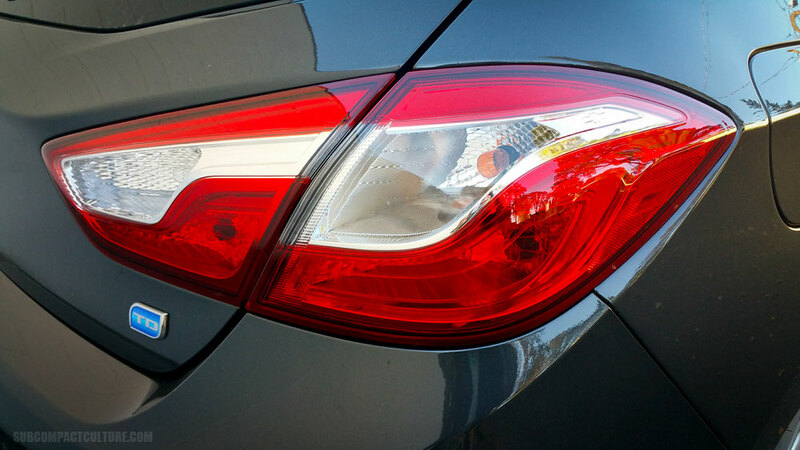 When it comes to infotainment and technology, the Cruze doesn't disappoint. To top it off, the vast majority of it is easy and intuitive to use. The touchscreen system and dial-based climate controls are some of the best we've used. Kudos go out to the Chevy designers who kept knobs for climate control versus having to go 17 menus deep to turn up the fan speed. Our tester also came with the Bose stereo, which sounded fantastic. The steering wheel-mounted controls were easy to use and worked as expected. If there was one tech bit that was out of the ordinary for me, it's the navigation. 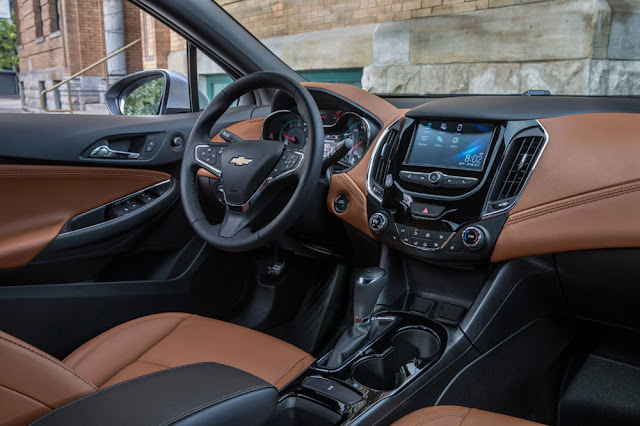 Instead of simply going to the nav button on the touchscreen and plugging in your destination, Chevy takes a different approach; a more human one. You press the OnStar button which then calls a real-live human being. You then tell that person you need navigation, and that person asks for the address. You give it to them and then they beam it down to the the car. Honestly, I hesitated doing this a couple of times before I thought, what the hell? Let's try it! As odd as it is, it worked great both times I did it, and the directions were spot on. There are only two minor gripes I had with the interior: The turn signal stalk felt unrefined, and there was a significant difference in height between the brake and the gas pedal. And when I say significant, I mean significant. Forget about any potential heel/toe movements on this one. 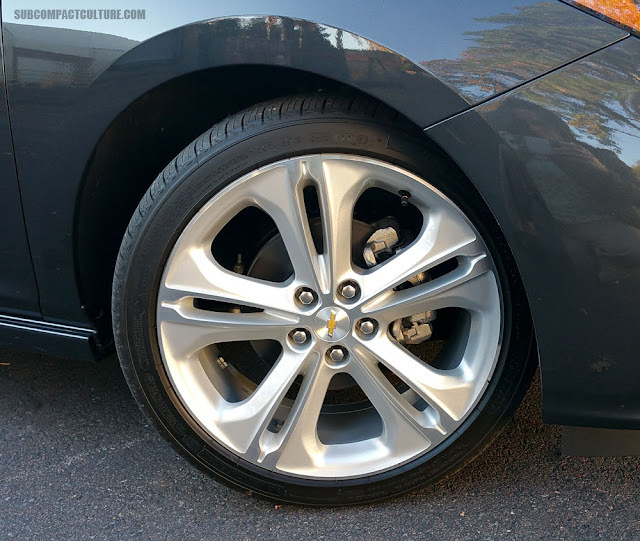 I was quite impressed with the Cruze Diesel Hatch. It looks great, drives very well, and is really versatile. The diesel offers a fun driving experience that is not only efficient but powerful and quiet. While we got 33.5 MPG with our tester around town, I'm 100% confident this little oil burner could rack up some serious highway mileage. Plus, it's kind of different. I mean you can even order up the "journalist special": diesel + hatchback + manual. All snark aside, Chevy hit the sweet spot with this car, and those people who wished VW would offer up the TDI again should definitely motor over to their chevrolet dealer. The new king of diesels just may be wearing a Chevy bowtie.